The Japanese concept of omakase—essentially putting the progression and content of your meal completely under the creative control of the chef—certainly isn't foreign to Chicago. But there is a relative dearth of ultra-high-end Japanese fine dining on which to blow whole paychecks for a few captive hours. That shortage is not only relative to Tokyo, but also to Los Angeles and New York, which both have higher populations of Japanese expats and therefore are able to support exorbitantly priced prix fixe Japanese restaurants such as Urusawa and Masa, respectively. The local milieu changed to a degree in August with the stealthy opening of Masaki, a 20-seat Streeterville restaurant from Mauro and Kimberly Mafrici, owners of the nearby Pelago, a pan-regional Italian spot that quietly persists on the loyalty of well-heeled neighbors and goodwill recommendations from hotel concierges. That's the clientele the Mafricis targeted first when they identified this tiny corner spot and decided what the neighborhood needed was a world-class Japanese restaurant. An e-mail went out to Pelago regulars announcing the opening, and that was the extent of their promotional efforts. In some ways the timing for such a place couldn't be better. Culinary Japanophilia is at an all-time high after the release of Jiro Dreams of Sushi, about Tokyo's legendarily uncompromising itamae Jiro Ono, and the opening last month of Next's Kyoto kaiseki menu. You may have missed out on tickets to the latter, but at the moment you can easily spend just as much money on dinner at Masaki and find yourself in a fairly empty room. That will probably change soon. The name, incidentally, is that of the Mafricis' original chef, a New Yorker who declined to relocate once the lease was signed. In his place they recruited Japanese-born Korean Jinwoo Han, most recently of South Barrington's Nozumi, owned by the same group that operated Ravenswood's late Blue Ocean. While set menus are antithetical to the idea of omakase, in which the diner's full trust is given to chef and his abilities with the products he has on hand, Han's multicourse menus look nothing like the pro forma selections of sashimi, nigiri, and silly signature rolls pushed at any of the hundreds of middling raw-fish peddlers across the city (see Blue Ocean). 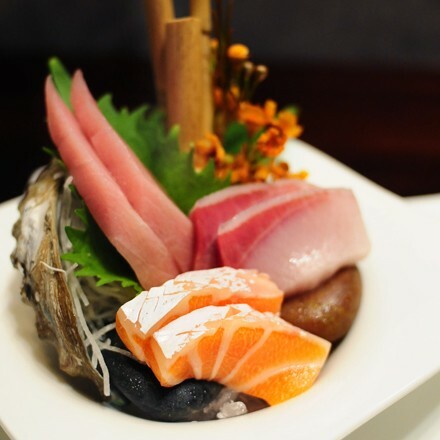 It's omakase in name only, but Han's menus display a wide diversity of raw fish and cooked creations not seen anywhere in the city—even at its current highest points, such as at Katsu, or more recently, Arami. This variety is most evident on the least expensive, three-course menu. For $98 diners are given a choice of three three-to-four-plate sets of dishes per course—say, steamed egg custard and shrimp, daikon, and tofu soup; a pan-seared scallop; and the humble Japanese pancake okonomiyaki appearing first, followed by three to four arrangements of raw fish (sashimi, nigiri, and otherwise), and concluding with a selection of cooked items such as soy-simmered stingray with rice, sauteed garlic stems and pickles, and a seaweed-clam soup. On the opposite end of the spectrum a seven-course menu, priced at a precipitous $178, is largely focused on raw fish, but billed as an "extravaganza—everything that we have in the house," according to general manager Paul Wilson, who added that this menu also features a surfeit of premium ingredients (lobster, abalone, etc). I opted for the middle option, a five-course menu balanced between the (very lightly) cooked and the raw, for $134. It began with two bites—a firm, sweet egg omelet (tamago) and a bite of glazed kabocha squash—and proceeded to a first course featuring a humble bowl of fish balls formed from minced yellowtail—like Japanese gefilte fish—bobbing in a light dashi broth. This was paired with a composed salad of jellyfish and kelp noodles in a sticky-sweet sesame dressing. Then came a sushi course: fatty, buttery, premium belly cuts of salmon, yellowtail, and tuna in a floral arrangement, next to three pieces of nigiri: tuna, meaty sea scallop, and creamy, foamy sea urchin wrapped in thinly sliced cucumber. That single bite of echinoderm gonad was among the freshest of the evening. More fish followed: another composed arrangement of red snapper, flounder, and amberjack sashimi in light ponzu, set before a fan of sliced apples that could have been less soft and mealy given the season, and a few slices of flash-torched tuna belly dressed in a citrusy yuzu vinaigrette. Warm cooked courses arrived next: a piece of black cod garnished with frazzled bits of its own skin and a flume-shaped purple yam chip sat bathing in a richly dark, practically meaty miso broth. This delicate fish was mismatched with a piece of crab and tough octopus bound in a thick straitjacket of kombu. The final course focused on slices of barely seared Wagyu beef with a baton of Asian pear to cut the richness, and a second, yonic-looking presentation: an angled bowl of rice seasoned with mushroom and miso, supporting a raw cylindrical formation of beef cradling a raw quail egg. Suggestive and bizarre but delicious. Dinner ended with a pair of house-made sorbets—orange and lemon—wrapped in nori and served alongside fresh berries and meringue. For $55, Wilson—who's been with the Mafricis since Pelago opened—paired the courses with a few sakes from the well-known and respected Kubota brand along with a few interesting curveballs: an Italian sparkler, a red-rice sake that shared similar qualities to a sour beer, and a house cocktail of sparkling sake with Asian pear. When I spoke to Kimberly Mafrici, she said she fully expects Masaki's customer base to expand beyond the neighborhood, and wasn't shy about admitting her and her husband's aspiration for the restaurant to win a Michelin star. But is Masaki there yet? The quality of fish stands up to what's served at Katsu and Arami, though the seasonings skewed toward the quintessentially American, with a slight oversweetness. The rice served with the nigiri also was somewhat less special than Arami's, and a few courses just missed the mark for an experience commanding this price point. Anyone unwilling to shell out that kind of money has the option to order one or two courses a la carte from the three-course menu, or can consider two- and three-course lunches (much friendlier at $38 and $46, respectively). But Masaki shows potential. It may not yet be Chicago's answer to Sukiyabashi Jiro, but there's really nothing like it in Streeterville, or anywhere else in town. Correction: This story has been amended to correctly reflect that the name of Masaki's general manager's is Paul Wilson. Will moviegoers deplete Chicago's sushi supply this weekend? Chef Joe Frillman’s veg-heavy pastatorium in Logan Square has range that extends far from Italy.